Of all the arts I have seen and tried over the years, few still retain that "magic". On one hand, I am far more appreciative of arts that I have taken up (no matter how briefly). For example, I've done enough painting to seperate truly skillful painters from those with only a basic mastery of techniques. However, certain arts still continue to amaze me-- arts like calligraphy, where no errors can be allowed. Oladesign demonstrates, not calligraphy, but a similarly skillful treatment. Working with pure white pottery as her canvas, she builds fanciful worlds with a deft touch and gorgeous linework. Her designs center around natural themes--leaves, branches, and animals. Each one imbued with a graceful liveliness. Although similar in style and treatment, the subject matter of each piece lends it a completely unique feel, and makes selecting favorites a difficult task! Just the same, the set of bowls below stand out to me. Many artists, given to such realistic depictions of the nature, would not venture into such a delightfully bright palette. However, oladesign not only goes there, she does a magnificent job. Despite the bright colors, the honesty of the leaves and branches is clearly communicated. Painting in the interiors of the bowls in matching colors, surprisingly, acts to subdue the effect of the vivid design so that it is still curiously calming. 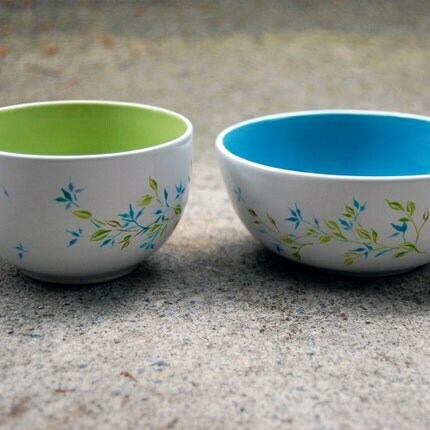 Matching without being matchy-matchy, these little bowls would work wonderfully as serving bowls or to hold odds and ends on a desk. 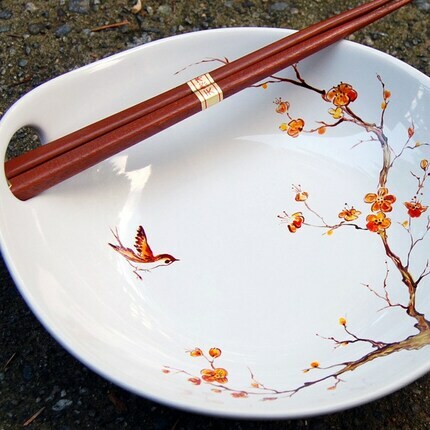 The next image shows a plate adorned with a flying bird and a tree in blossom. The delicacy of the linework in this piece is astounding. Pay close attention to the detailing on the flower or the darker "outline" around the tree trunk. Painting pieces like this requires an economy and fluidity of lines that absolutely astounds me. One stray mark can ruin or alter an entire piece, often taking you in directions you did not want to go. However, each line in this piece feels deliberate, planned, and expertly placed--without feeling stilted or tense. The ability to transform a few lines into living creatures is a magical one. Creations like those in oladesign continually inspire and amaze me. These are pieces that you can buy equally for show and function. Whether you use them daily or put them on display, they are sure to bring joy and beauty to your life. What beautiful work. Thanks for highlighting this artist!